Tourmaline is a Silicate mineral. Silicate minerals are the largest family of minerals, including more than 25% of all known minerals and 40% of all common minerals. In addition to being a major part of the Earth’s crust, Silicate minerals have also been found on the moon and in meteorites. Silicates are minerals which contain the elements Silicon (a light gray shiny metal) and Oxygen (a colorless gas). Together, these two elements form a tetrahedra – a shape similar to a pyramid – with a Silicon atom in the center and Oxygen atoms at each of the three corners. These tetrahedras connect with other chemical structures, in six different ways, to form various minerals and rocks. There are six main groups of Silicate minerals, and these main groups are further subdivided into a variety of secondary subdivisions, such as Quartz and Feldspar. Another such subdivision is Borosilicates, which are silicate minerals which contain the element Boron (a brown metal). Tourmaline is a generic term which refers to 11 varieties of borosilicate minerals. The most valuable variety is Elbaite, which comes in every shade of the rainbow. Watermelon Tourmaline is a type of Elbaite that includes both green and red/pink in the same crystal. Watermelon Tourmaline works wonderfully with the Heart chakra, cleansing and removing blockages. As a balancing stone, Watermelon Tourmaline aids in removing insecurities. 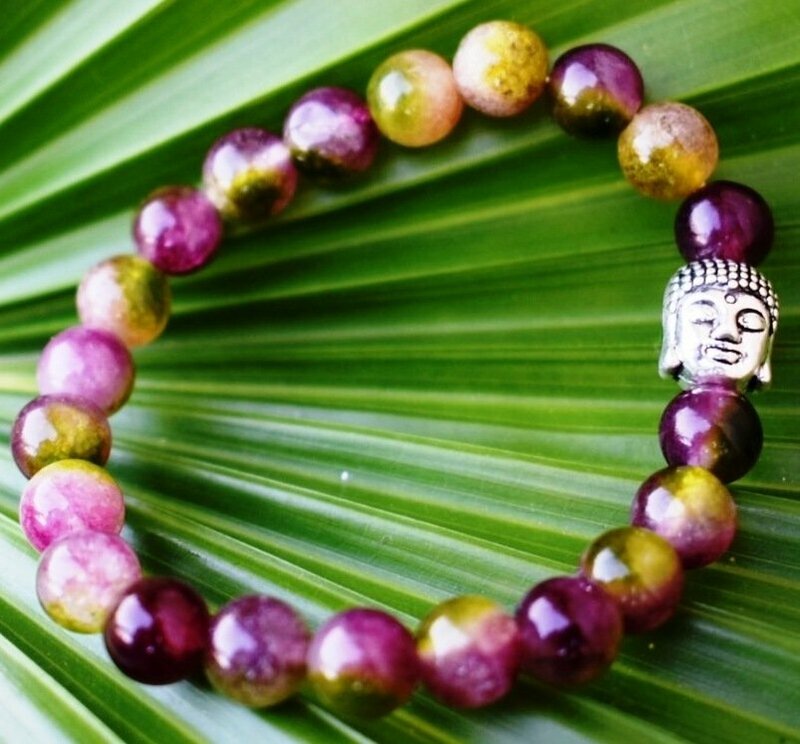 As a balancing stone, Watermelon Tourmaline functions as a combination of male and female energies, both Yin and Yang together in one crystal. It can help to inspire both creativity and practicality, and connects the Heart Chakra to both physical and spiritual vibrations. Watermelon Tourmaline calms overactive emotions. Watermelon Tourmaline crystal is also believed to help attract love and resolve issues in relationships, infusing them with joy and Divine Love. Watermelon Tourmaline can help to lessen depression and mend emotional wounds by allowing the owner to see the meaning for certain events in life. Meditation with Watermelon Tourmaline can aid in the release of unhealthy patterns of behavior, making room for new ways of thinking that lead to a more complete life. Watermelon Tourmaline Crystals are great for meditation, energy-work, and grid-work, and make a great addition to one's medicine bag.